Venerable Geshe Kelsang Gyatso Rinpoche is a contemporary Buddhist meditation master renowned throughout the world for the path of wisdom and compassion he has introduced into modern society. This special path is helping thousands of people in every continent find meaning and hope in their lives. Through over 40 years of teachings, 23 authoritative books and a global network of Temples and meditation centres that he has established, he has made the immensely practical teachings of Buddha available to us in a form we can easily understand and practice in our busy modern lives. His profound personal experience of the entire path to enlightenment is revealed in the 23 authoritative books on Buddhism and meditation he has written. 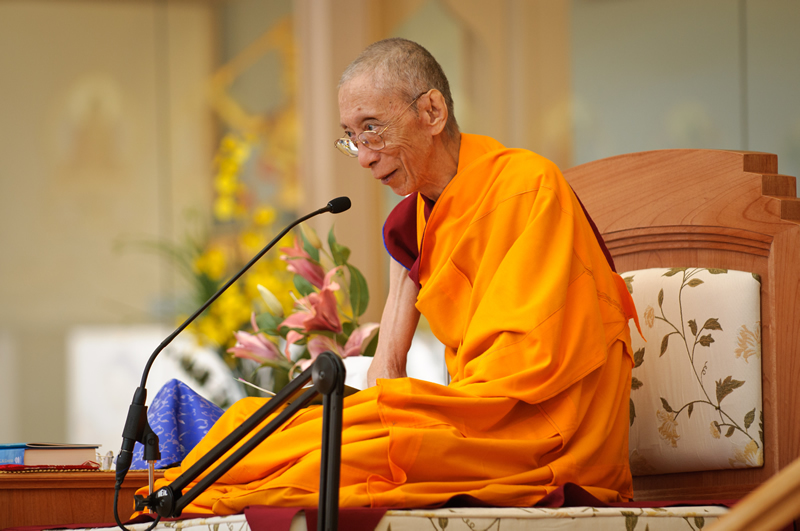 Venerable Geshe Kelsang’s deep wisdom, clarity, and ability to convey even the most subtle teachings of Buddha to the people of the modern world are revealed in the thousands of inspiring teachings he has given worldwide in the last 40 years. Venerable Geshe Kelsang teaches that all the problems we face in the world originate in the mind and that the only way to solve them and to find true happiness, both for ourselves individually and for society as a whole, is to learn to improve our mind.